Call Summers Towing & Repair for crane services at your drilling well pad, job site or just about anywhere. 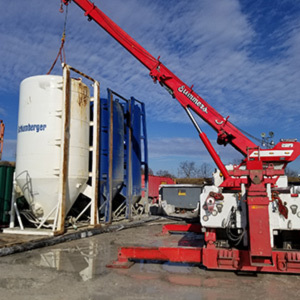 Our heavy duty recovery operators will skillfully and efficiently move the items only a this rotator crane can manage. Our sliding rotators excellent for heavy duty lifting and special recovery. Our expert staff is trained with the skills necessary to make the safest recovery of any situation. This workhorse features a rotating & sliding boom. Boasting more than 55 feet of elevating reach, and a maximum carry rating of 160k pounds. This awesome machine excels where others cannot. From mining equipment to diesel generators, our 80-ton rotator can pick & move just about anything. We have 50 and 65 ton rotators on standby for jobs of any size. reaching into spaces too small for standard cranes, while packing the power to move items too heavy for fork-lifts. Our service area stretches from Morgantown West Virginia, to Pittsburgh, Frostburg, Medina, and Charleston. Summers has rescued vehicles from the toughest scenarios, to the strangest of locations. We utilize top-of-the-line equipment, paired with the highest training available in the industry. When you need the best, call us. Dream it, and chances are our staff has seen it; winching and recovery from situations far too difficult for our competition. Our expert staff is trained with the skills necessary to make the safest recovery of any situation. All operators are NRC and TRAA certified.